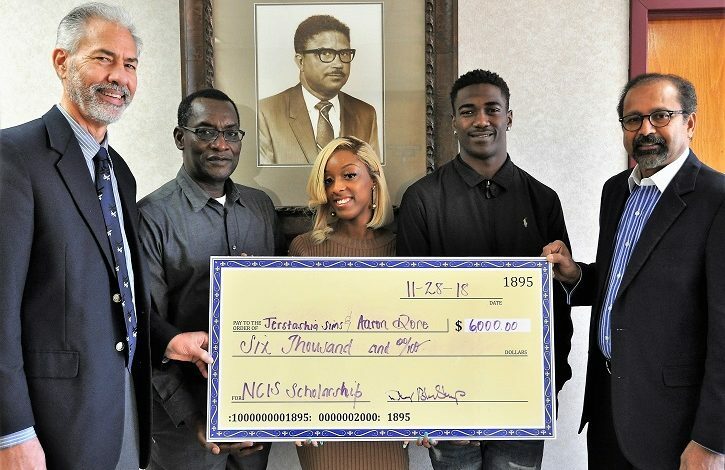 The National Crop Insurance Services (NCIS) recently awarded a $3,000 scholarship to agricultural economics majors Jerstashia Sims and Aaron Dore. The 21-year-old Wildcats learned about the scholarship from their adviser, Dr. Mohammed Ibrahim, coordinator and professor of the agricultural economics program. Sims and Dore thanked NCIS for the award. “There have been semesters where I couldn’t take many classes due to how much financial aid I had. I would like to thank them because that scholarship helps get me closer to graduation,” Sims said. First time applying for a scholarship, Sims was surprised to receive it. “I worked hard to get to where I’m at now. I had some obstacles my freshman year and have come a long way. The fact that I worked hard to get my GPA (grade point average) over a 3.0, it’s an honor to receive this scholarship,” she said. The Jefferson County, Georgia, native plans to attend graduate school and desires to have a career in agribusiness. Initially interested in studying criminal justice at FVSU, she learned about the many opportunities available in agriculture. “You’re not boxed in. It’s a very broad major and I stuck with it. I’ve grown to really love it,” she said. Dore is also proud to receive the NCIS scholarship. “It’s an honor to get an opportunity like this and to have money go toward school,” he said. Receiving a football scholarship to attend FVSU, the Henry County, Georgia, native said he didn’t know much about agricultural economics before visiting the campus during freshman orientation. “There are a lot of opportunities,” he said. The Wildcat cornerback is interested in pursuing an internship, as well as graduate school. “I want to work for the private sector in agriculture,” Dore said. He and Sims are members of Minorities in Agriculture, Natural Resources and Related Sciences (MANRRS) and have research experience. Dore worked as a student researcher to study organic vegetables, and Sims assisted FVSU’s Cooperative Extension Program in developing a survey to gather information on farmers’ land use. The seniors commended Ibrahim for opening those doors for them and pushing them to work hard for every opportunity. They said they’re better students and people because of his support. NCIS is an international nonprofit organization representing the interests of private crop insurance companies. The $3,000 scholarship is spread over four semesters. Sims and Dore are required to maintain a cumulative 3.0 GPA and have an agricultural discipline major. In addition, they must provide a statement from their department head that they meet the requirements and continue as full-time undergraduate students in good standing at FVSU. For more information about applying for the NCIS scholarship, contact Ibrahim at (478) 825-6815 or ibrahimm@fvsu.edu.